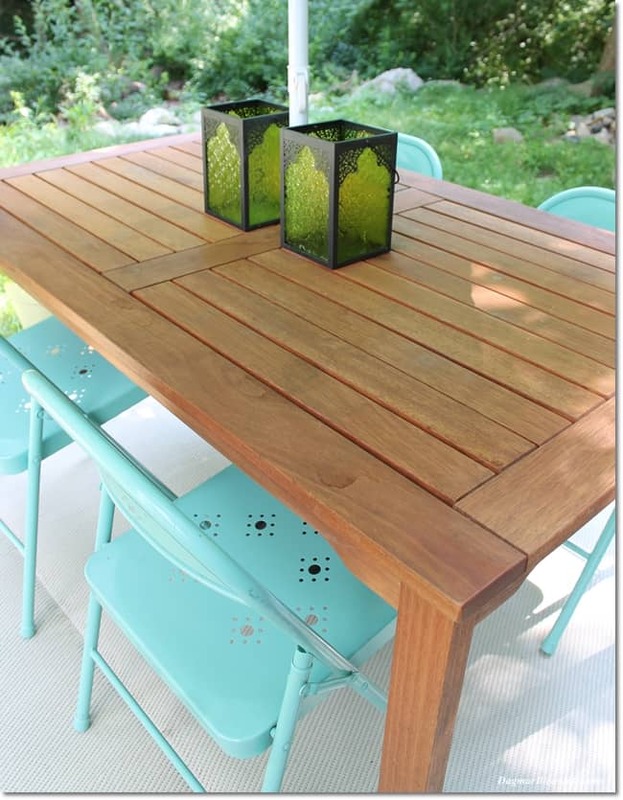 If you have been on Pinterest in the last few years, or read DIY blogs, you have seen how popular DIY pallet projects are. People make furniture out of pallet wood, or signs, or huge America flags. We inherited some pallets when we bought our house, and we got more when we did our stone driveway. Don wanted to get rid of the pallets, but I had other plans for them. Meet our DIY pallet deck. Our “backyard jungle” and a pallet deck. It truly looked like a jungle with tons of vines growing up the trees, and it still does a bit. 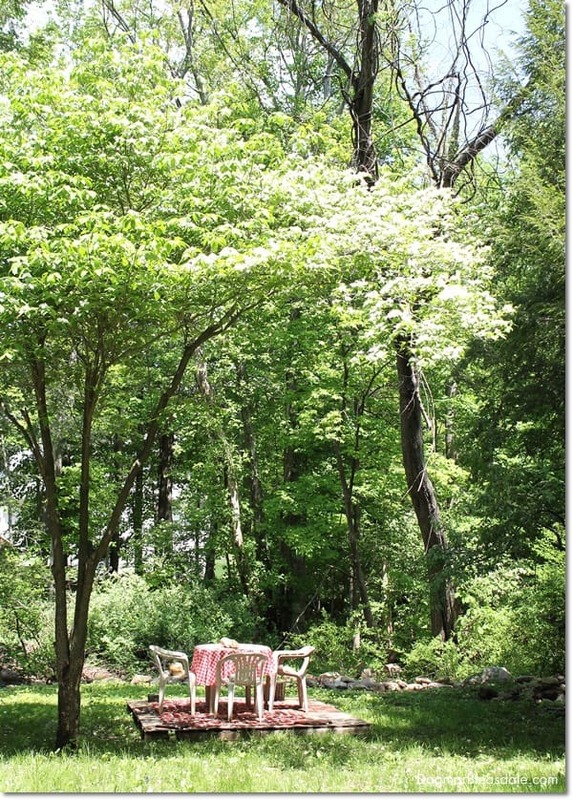 Our backyard needs so much help, it’s going to take either years or a lot of money to make it over. It would be great if we could just hire a landscaper to do over the whole backyard, but that’s not in the budget. It’s not our priority to spend money on our backyard. I have focused on the front yard and a small container garden on the side of the house so far this summer. As always, my motto is that being on a budget doesn’t mean that you can’t make pretty or some improvements. It doesn’t have to cost much to improve your backyard a little bit every year. 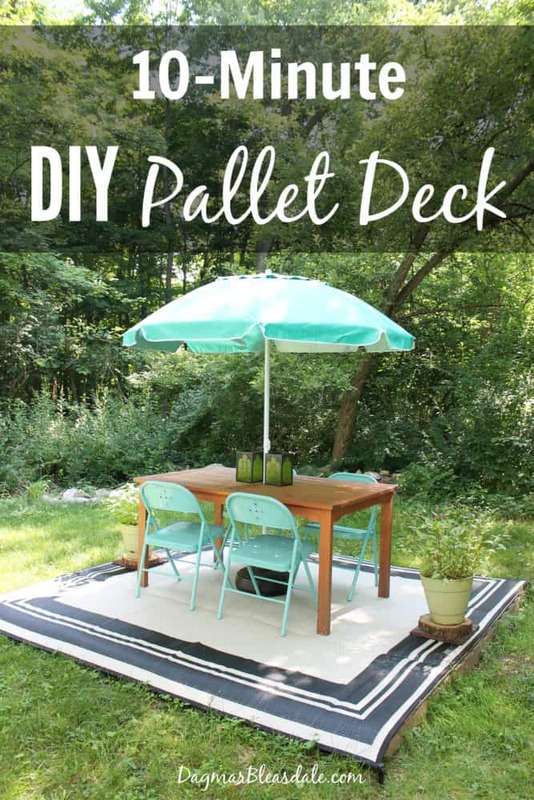 Anyone can make a pallet deck — you can usually get pallets for free since people always want to get rid of them. Just look for them on Craigslist, or contact a local store that regularly gets items delivered on pallets. A nice backyard deck is definitely on our wish list and something Don wants to build for us, but since that wasn’t happening for a while, I wanted to make a temporary one. So last summer, Landon and I pulled four pallets into our backyard, and we pushed them together to make one platform. The pallet decks I see on Pinterest have the gaps in between the wood planks filled in, but what we did was much easier: we simply added a leftover plywood sheet to the top of our pallets, and a few interlocking floor decking tiles like these to fill in the spot that was left over, so there was no carpentry involved. We added a left-over outdoor carpet, our plastic table and four chairs on top of it, and we had our first version of a pallet deck. 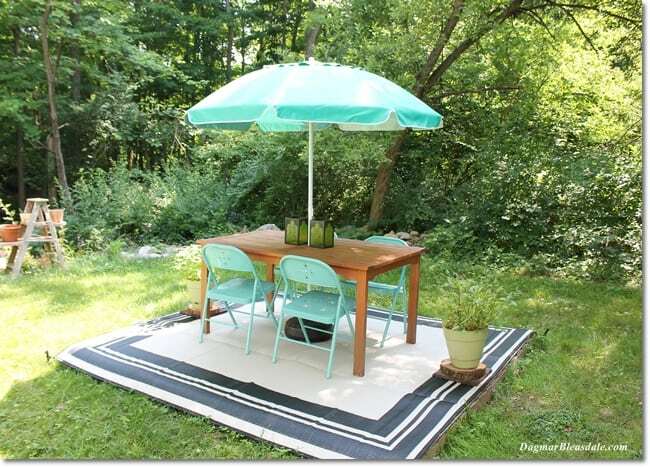 The outdoor rug was advertised as a “patio mat,” but when it arrived, it was called a “camping mat”, was folded twice, and came in a bag with a handle and four plastic stakes. I actually didn’t mind because as you can see, it works out great that the stakes are holding the outdoor mat in place. The rain runs through the mat, and it dries fast, so it’s pretty durable for outdoors. The potted plants are weeds that planted themselves, ha! I bought this table online last year for I think $200, and the metal retro chairs were on sale for $10 at Target. The umbrella is actually a beach umbrella — it’s much lighter than a market umbrella and only cost $15, compared to the heavy market umbrellas that can cost a lot more and harder to handle. I wasn’t crazy about how heavy most umbrella stands are, plus they are also pricey, so I found this one made out of plastic that you fill with sand or water — only that I don’t have to fill it with anything because the beach umbrella is so light. Last year I filled it with some water to make it a bit heavier. The nice thing about all the items I bought for this DIY pallet deck setup is that they are all very light and can be put away in minutes. We plan to enjoy our pallet deck this summer and fall quite a bit, and maybe I’ll even make it bigger and add two more pallets. Making a deck out of pallet is definitely one easy way to make an instant deck if you want one, even in a small backyard. What do you think of our makeshift deck? Thank you so much for sharing this! I had plans last year to make a pallet deck like you mentioned, filling in the gaps with small wood strips, but it just seemed too daunting. I do all of my diy projects by myself, so this version is completely doable for one person, and i am definitely doing it! 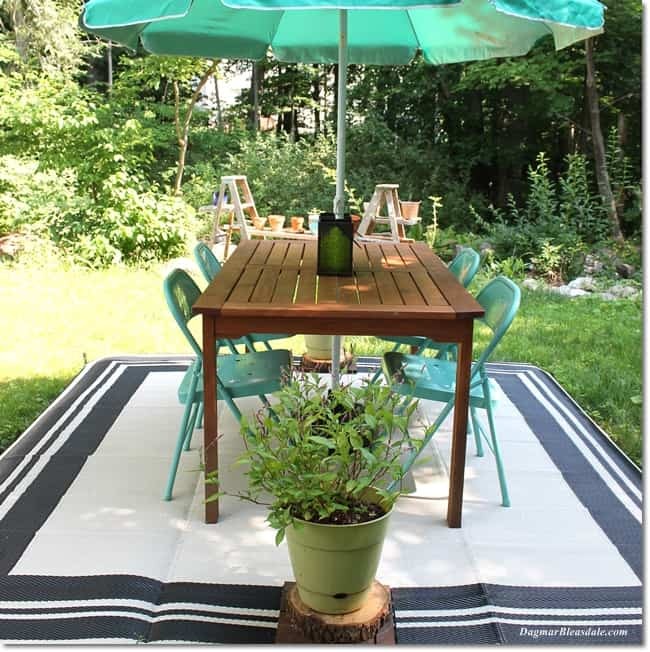 These are great ideas to create a nice outdoor dining area. 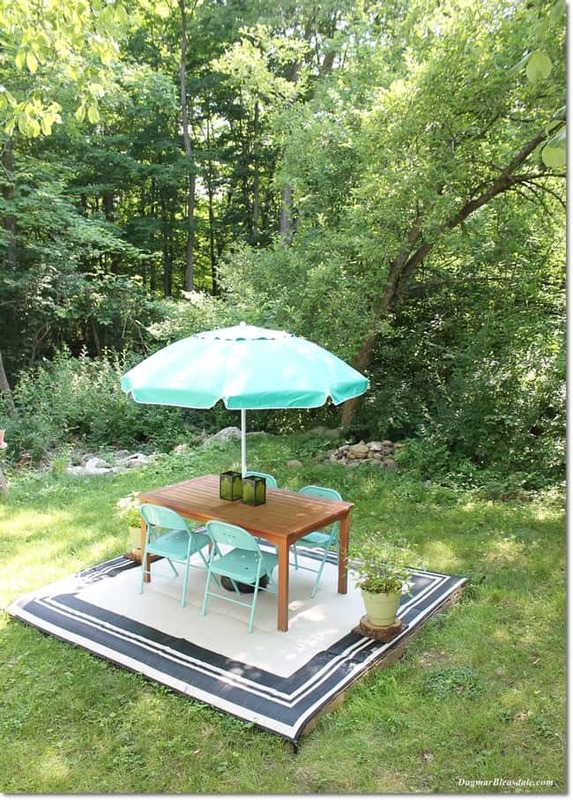 I like the camping mat, especially as it can be staked down so that it doesn’t get out-of-place when the wind blows. What a great idea! Thanks for sharing it at Talk of the Town – I’ve chosen this as my feature pick for next week’s party! 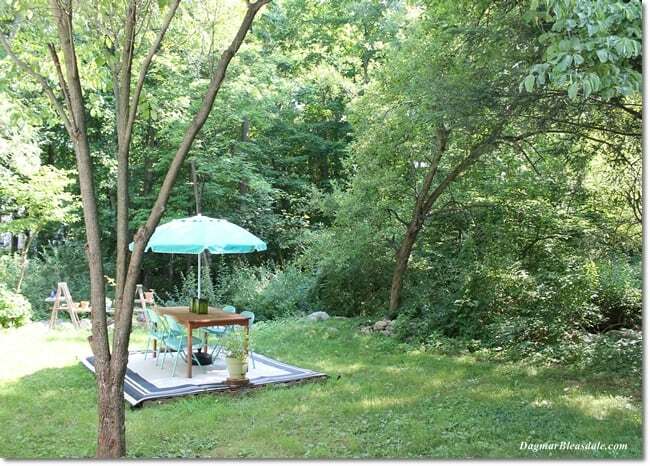 what a great little spot, i looove your yard space! I love it! Great job using what you have and being creative. 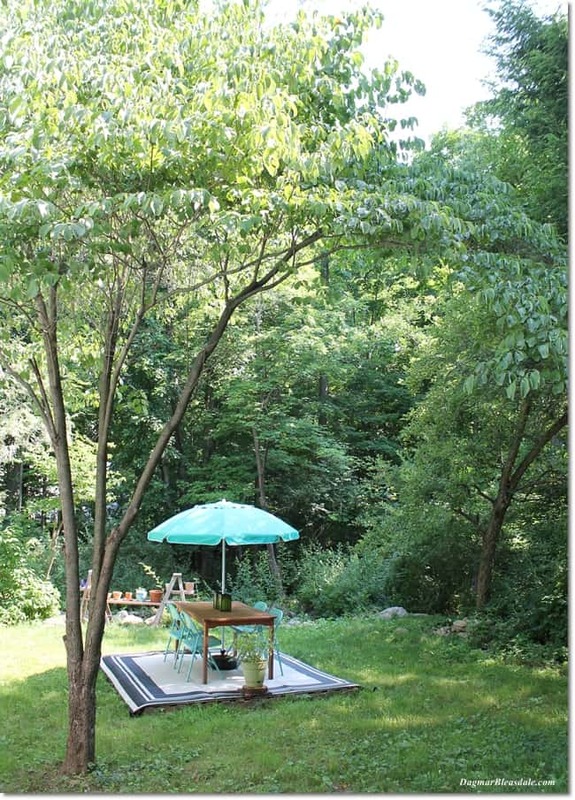 We want to try and make “garden decking” in our backyard eventually. Beautiful makeover. I like it last year too! 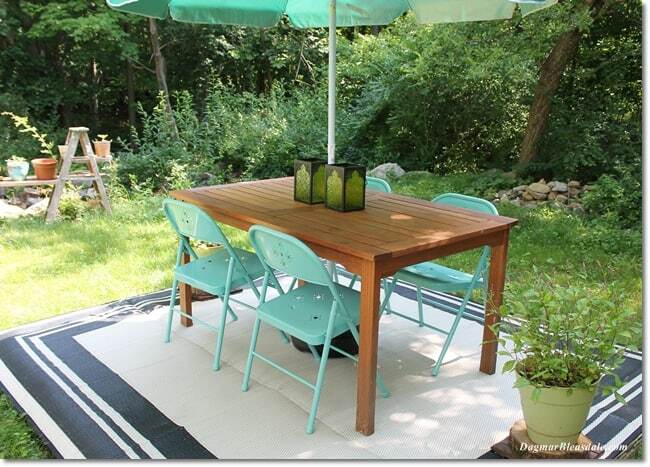 Love outdoor dining! Thanks for sharing with us at Merry Monday.